Hello to all my new OVER THE BIG MOON friends! My name is Amie Ellis from dumbbellhousewife.com and I am so excited to give you your monthly dose of fitness inspiration. Who am I? I am no one really. Just a mom of four kiddos, a wife to a fabulous man, an instructor, a trainer, a life coach, a friend, daughter, sister and lover of life. Wow, I guess that makes me somebody! Why do I do this? I do this to inspire women to change their thinking. After years of training, I realized that the majority of women I met had a very low self esteem about themselves. My mission became very clear and I knew exactly what I wanted and needed to do. I needed to start a revolution; a revolution of women that didn’t hate themselves. Where and when? Every first Wednesday of the month I will be here at ‘OVER THE BIG MOON’ to help and inspire you in your healthy living journey. I can’t wait to get to know you and hear your stories. 1-Drink lots of water. 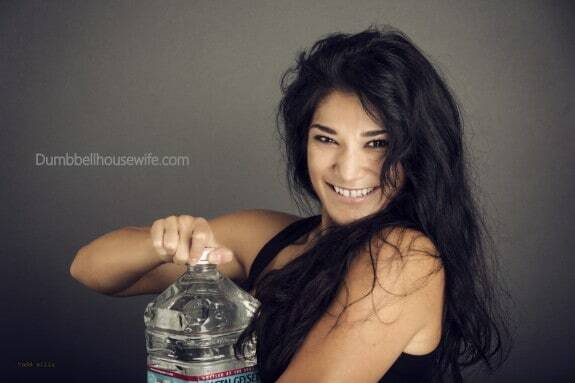 We at Dumbbellhousewife.com are trying for a gallon a day. I know, I know, that is a lot of water, but the rewards are well worth it. My family loves milk and goes through it like crazy, so I have started taking one of the gallons and filling it up with water and putting it in the freezer until it is icy. I CAN NOT STAND WARM WATER. 2-Be positive. I want you all to start slowly changing your negative thoughts to positive ones. This can take some time, because you first have to recognize the thoughts before you can change them. I can’t tell you how many times a woman will come to me and say this…”I am fat, I hate my legs, I hate my arms, I feel like I have an ugly face, I am tired, I am sick, I am a bad mom.” Holy heck, how can anyone feel good about herself with thoughts like that? Here is your goal… Every time a negative thought pops into your head, replace it with a positive one. I am healthy, I am happy, I am a great mom and I am filled with energy are some of my faves. 3-Get a journal. Use your fitness journal to write out a plan and course of action. Words are nothing without actions behind them. I tell my clients to write down the food that they eat during the day. That way I can keep the things that they really love to eat in their clean eating diet. Remember that healthy eating isn’t the same as fat loss eating. Your goal should be to find the things that work for you. The best diet and workout routine is the one that you create. Nobody knows your body like you do. I can’t wait to share all my tricks, recipes, workouts, inspiration and healthy living tips with you in the coming months. Let’s inspire each other. Also, feel free to jump over to dumbbellhousewife.com and learn more about me! You can also find me in Facebook! Much sweaty healthy love! I love this so much! I can’t wait to hear more fitness tips as the months go by! You guys will be a great fit! Just love all the great tips Amie gives out. She makes it so simple and fun for everyone to learn. A truly inspirational person. Love this! Amie is amazing and can’t wait to learn more! Love it! Excited for the new segment, and can’t wait to see what’s coming! I’m so excited to see this new series starting! Can’t wait to see what is in store – off to check out dumbbellhousewife now! Great tips Amie! I’ve really been trying to become a more optimistic/positive thinker. I can’t wait to hear more of your ideas on how to transform my way of thinking! Yay! Amie is my fav and all her workouts and advice always come in so handy!!!! I am so glad Amie is on here!!!!! I feel so completely lucky to live in her town so I can train with her. She really is my life coach, I tell her that all the time! Everytime I’m around her, I feel so uplifted, inspired, and motivated to be a better more positive happy me! SOOOOO excited to read her posts!! Amie truly is the most motivating person I’ve ever met. I have trained with her off and on for years now and she honestly help change me into a better person inside and out. I love how Amie breaks things down to be very simple. You can start slow and easy and still feel good about yourself. When you are around Amie, you always come away feeling happy!